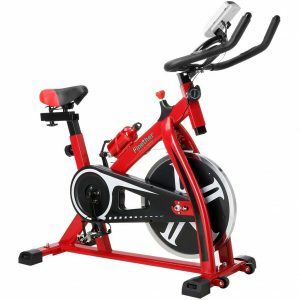 Red and black FineTher Exercise Bike is an indoor, chain-driven, stationary spinning type bike with a decent 17.6-pound (8kg) size flywheel. With its sturdy build with a heavy-duty steel frame it has a maximum user weight capacity of 265 pounds or 120kg. It is not a foldable bike but comes with the front transport wheels for easy relocation and storage. You can enjoy the smooth and quiet cycling experience consistently. It is suitable for use by you every day or different people in your house as it is but durable. But despite having a commercial level solid construction it is not designed for use by tens of different people in gym settings.The rating for this bike is 3.7 out of 5 on the day of this review mainly because of the non-suitability for people over 5’7” of height. It has the double locking knobs for the seat and the handles to give you more stability. You can sit or stand up while riding this bike by stepping on the aluminum alloy pedals with forged spindles. You’ll get a sense of cycling on an uphill road. You can change the level of resistance by hand via the tension knob and have an easier or more challenging workout. This also works as an emergency brake when you wish to stop your session by simply pressing the knob down. The seat can be adjusted for height between 29 and 33 inches (74 to 84cm) to fit most users at different heights. And the distance between the handles and the saddle is adjustable between 35 and 39 inches (90 to 100cm). The pedals have toe clips with straps that can be adjusted to fit different sizes of shoes. You’ll find the leveling feet underneath so that the bike feels more balanced and stable during your workout. It has an LCD digital display panel that works on two AAA batteries with the stats like distance, calories burned, speed, time, and pulse rate linked to the sensors on the handles for you to keep track of your workout indicators and stay motivated. You can adjust the time, intensity and speed of your exercise with these stats. The large saddle is large and has a coil spring at the base for you to stay comfortable during your workout. The handles are foam-wrapped and ensures easy and comfy grip, again for comfort and ease of use. You’ll be less likely to get blisters or injuries. There is a water bottle holder in the middle and you’ll get the bottle that you see in the photo included. Owning a solid and comfortable bike like this gives you the opportunity to burn calories and fat in the comfort of your home without suffering the adverse weather conditions in the heat and cold. If you are tall, like more than 5’7” tall then you want to adjust the saddle height to the max. Red and black Finether Bike weighs 57.1 pounds and measures 17.5 x 36 x 39 inches. In the box you’ll find the Finer exercise bike, an easy to understand user manual for operation and assembly as well as simple tools and hardware needed and a water bottle. It is easy to put together and once you start using it you’ll realize how solid, stable, functional, user-friendly, and comfortable it is. Please bear in mind though that it is not really suitable for very tall people, over about 5’7”. That’s how this great bike got the negative one -star ratings. Otherwise it is a rather sturdy and powerful unit.